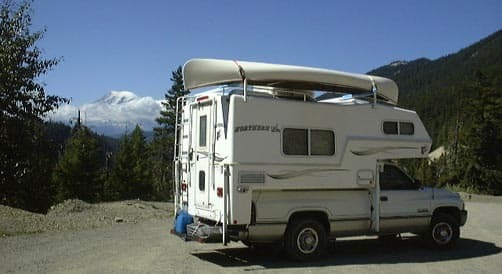 Inspired by our truck camping experiences, I wrote the following article on how we, “Do More and Spend Less” in our Northern Lite truck camper. 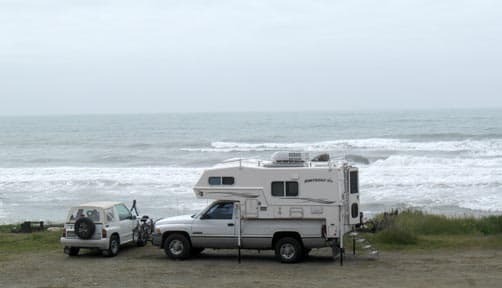 A month after my graduation from college, my husband and I purchased a thirty-two foot Airstream travel trailer, sold our 2,500 square foot house, and became full time RVers with a limited income and a very long list of places to visit. After more than 150,000 miles and few sets of tires, we needed to drop anchor. First we sold our Airstream. Then, a few months later, we purchased a Northern Lite 9.6 Queen Classic truck camper that complimented our new log cabin in Texas. Our life has not been the same since. When getting ready for a new adventure, we start by researching and finding a great destination. Once we have a destination in mind, we use maps, online information, and travel books to find special places to visit on the way. These “on the way” places are often well off the beaten path. And we always have some wonderful “surprise detours” along the way. After a few trips visiting our daughter in Colorado, we also came up the idea of never taking the same road twice. This gives us the opportunity to discover new roads and new experiences, even in our home state of Texas. 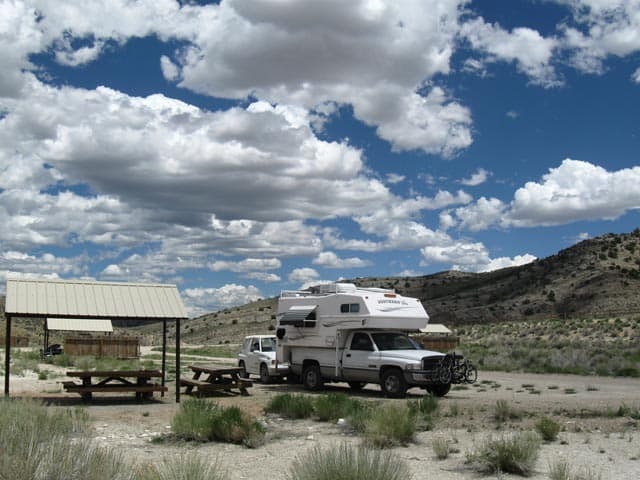 We have assembled a bank of good campground information including National Park campgrounds, National Forest campsites, BLM areas, and some state parks. This bank of camping sites gives us a wide selection to choose from when we’re on the road. 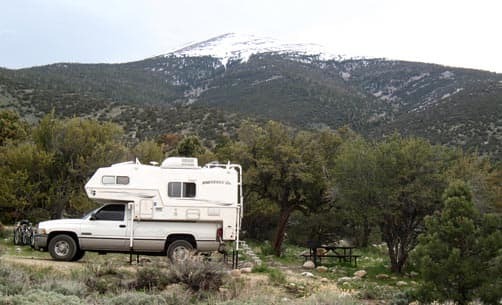 If we stumble on a free campsite not known to us, boondocking it is! We arrange our travel plans according to the annual temperature and weather patterns. For example, we only visit New Mexico, Utah, Nevada, and California in May and October. Because of our self imposed “restrictions”, we are forced to create routes that are not always a direct path to our destination. For example, once we made a 300 mile detour to see a friend. The rewards of seeing our friend were far greater than the cost of 300 miles of fuel. We hope you know what we mean. Last, but not least, we learned to have fun while on the road. We have created a good number of road games. Our favorite is, “No Interstate Highway”. It’s very, very rare that we have to be on an interstate. We have great countries, the United States and Canada, for alternative routes. 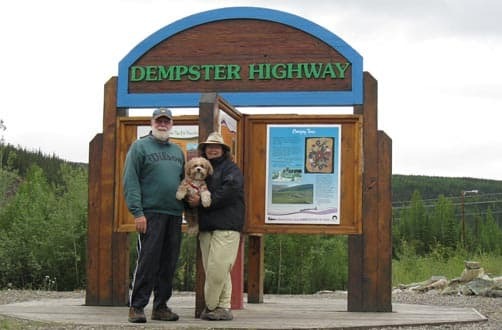 On our big trip last summer, we were only on interstates for fifty-two miles. Here again, avoiding interstates is a way to help us discover hidden paradises. Staying in one area and exploring it well is also important to us. We try to maximize our adventures. In doing so, we’re also able to maximize our budget. We travel less than 250 miles each time we move. More often than not, we travel less than 100 miles because we find something to look at that no one told us about. Do more!